On November 1, 2014 in Los Angeles was the second day of Stan Lee's Comikaze 2014 convention. We arrived early in the morning to get acclimated and immediately sought out Kristin and Tara who were in the Artist Alley signing autographs for the fans. We spent a time with Tara and Kristen and Kristin gave us each special guest passes to the afternoon event. We then, walked over to the mainstage area to see what that was like and to our surprise, there were no chairs for the attendees to sit on. While Comickaze is very like Comic Con as it relates to the exhibition hall, it is not like it in its panels. The True Blood panel was to start at 2pm and right before that was the Game of Thrones panel at 1pm. Since we had time, we decided to go over to the WEEV booth to check in there. We stayed there for a while and learned more about the app and then went back to the autograph area. When we arrived, EJ Scott was there visiting with Kristin and Tara and we all hung out a bit longer. At 1pm we went over to the Hot Topic main stage to see the Game of Thrones panel and try to get as close to the stage as we could before the 2pm True Blood panel. Attending the Game of Thrones panel was Alfie Allen, (Theon Greyjoy), Gwendoline Christie (Brienne of Tarth) and Esmé Bianco (Ros). The True Blood panel was sponsored by Stephen Moyer's app, WEEV and the questions asked of the panel didn't come from the audience, as it did in other panels, but from those who had asked on Weev. 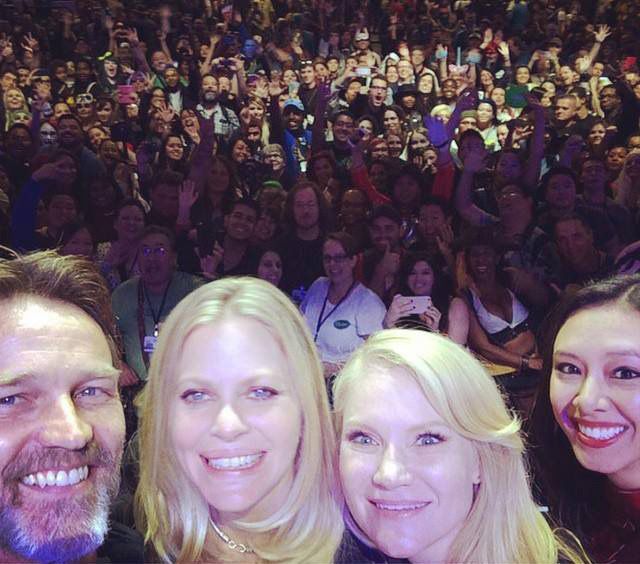 The panelists were Stephen Moyer, Kristin Bauer van Straten and Tara Buck. Before the WEEV questions started, the moderator asked what each were are doing now that True Blood has ended. Stephen discussed his recent trip to Morocco to film "Killing Jesus," Kristin discussed her upcoming work and her return to "Once Upon A Time" as Maleficent and Tara revealed she has been filming in Vancouver. The questions then came from via WEEV and the first question asked how they feel now that True Blood has ended. Once again, a WEEVer asked if there would be a True Blood musical or movie and the final question was "what was your favorite season of True Blood?" Check out the 100's of photos we have in The Vault's Comikaze 2014 Photo Gallery.